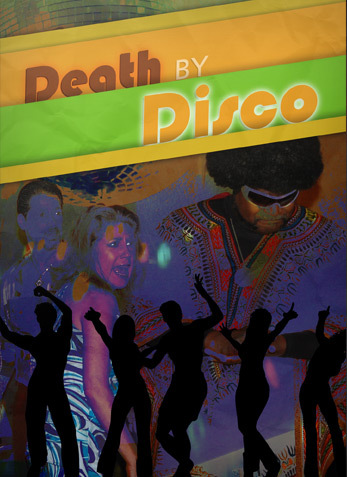 It's 1978, and it should be a night of disco, dancing and...possibly death! The highlight of the evening is the huge Disco Dance contest. The winning prize is a trip for two to New York City for the chance to dance on the Grammy Awards, and $10,000 in prize money. This is an opportunity that could make someone a star; it could also be a motivation for murder! So, put on your platforms, unleash your leisure suit and hustle to the beat...we're going to have a party tonight! This high stakes dance contest has brought together a wide assortment of characters you'll want to meet: Dana Winter, the Disco Diva with a voice of fire and a heart of ice; Vinnie Vinucci, Dana's dance partner, and the guy with a record that ain't vinyl; Damian Moonrock, popular disc jockey with secrets to hide; Sylvester Wolfe, head of Notown Records; Tanya Terrell, a country singer with a thing for Sylvester; and Marie Aqua Nette, the hair dresser who is determined to make it to the top of the dance world. Rumor has it that some of the assembled participants might have more than dancing on their minds. In the event of an untimely death, it will be up to you and your table of fellow sleuths to discover who could commit such a crime. So, think of a clever name for your "detective agency" and listen carefully as events unfold. At the designated time, your agency will be asked to formulate a question that your delegated chief detective will ask a suspect. Once all tables have completed their questioning, each detective agency will submit a solution sheet indicating "who done it" and why. The first agency to name the most correct culprit and motive wins. The popular new dance "The Hustle" was named after this guy! He's got all the moves and his eye on the prize in tonight's big contest, no matter what it takes to win. He has had various girlfriends, and jobs, and his police record speaks volumes. Vice + vanity + vacuous + venomous = Vinnie. Could we add "victim" to the list...or villain? Hairdresser at the Kurly Kue Kut and Kurl with a desire for a permanent place on stage. She's here tonight to set a certain ex-boyfriend straight and to become the "mane" contender for the purse. Will Marie make someone's hair stand on end? Will she tease all the guys? Is she "dying" to do someone in? Is she about to have a brush with death? Move over, Donna Summer, Dana is planning on taking her perch as the top disco songbird. She sings so sweet and dances to the beat, but this chanteuse is taking no chances when it comes to stardom. She knows how to play the music game and will do whatever is necessary to succeed. She could knock 'em dead, or tonight could be her swan song. The DJ who spins the hits and reaches for the stars, especially if those stars have anything to do with a recently released sci-fi movie. He specializes in exporting what no man has exported before. For a guy who's into the celestial, he could end up deep in the terrestrial (as in a dirt nap)! In other words, his orbit could terminate in the orbits...or, he could make sure that someone else's rocket crashes and burns. Head of the new disco label, Notown Records, Sylvester's nickname is "Sly", and many people would say that this describes the man and his business practices to a tee...they would also use the term "lounge lizard." Is there really a reptile lurking beneath all that polyester? Will he strike back at his enemies or will he slither into the nether world? County singing sensation and headliner for Wrongdoer Records (until it turned into Notown Records); she loves Elvis and the simple life of a country music star. She wails from the heart about love gone wrong, and may be looking for new material from which to work. Will that mean warbling the jail house blues, or will her voice be silenced? "BG" is a trusted security guard who has been hired by Sly Wolfe to keep an eye on tonight's big event. He has been around the entertainment business for years, so he knows how to spot shady characters in a minute. He'll be "keepin' his ears on" just in case anything strange should happen tonight. 10-4 Good Buddy!